Performing engineering surveys in remote areas and difficult climatic conditions is impossible without developing and testing of new technologies for engineering surveys. This scientific and practical activity of our company is an important component for successful work in the Arctic and beyond. Gas pipeline "Bovanenkovo - Ukhta"
We express gratitude to LLC MSU-Geophysics for the partner support of the Plenary Session and participation in the VII International Scientific and Technical Conference "Development of oil and gas resources of the Russian shelf: the Arctic and the Far East" (ROOGD-2018) and the exhibition "Technique and technology of offshore fields development ". 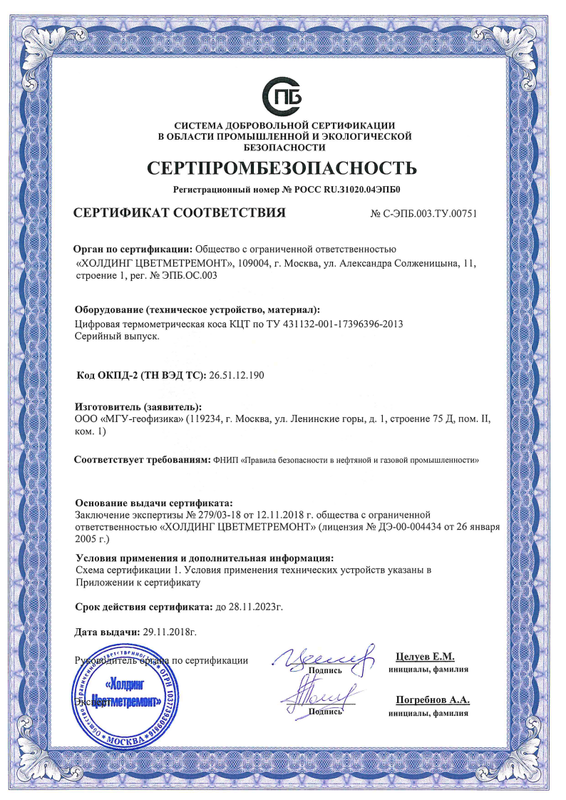 LLC "Arctic Research and Design Center for Offshore Development"
Field, laboratory and cameral work was performed in full in accordance with the requirements of the technical specifications. The high qualification of the employees of MSU-Geophysics LLC and their professional interest in the work performed ensured the quality of the work performed. It should be noted that the executor was prompt in eliminating the comments; comprehensive questions were received on all questions. In 2013, MSU Geophysics LLC performed microseismic zoning work on the OPS Trudovaya. These works were performed professionally, in accordance with the requirements of the technical specifications and deadlines set by the schedule. The team of MSU-Geophysics LLC has fully completed its tasks and developed recommendations for the further design of the facility. For the period of work with MSU-Geophysics LLC, employees of the company have recommended themselves on the positive side. Their work meets the specified level, performed qualitatively and strictly on time. In 2008-2012, MSU-Geophysics LLC carried out a complex of engineering-geological and engineering-geophysical works at the Pavlik gold deposit in the Magadan region. ... The work was carried out professionally, in accordance with the calendar plan and technical specifications. The company's team fully complied with the tasks set in the technical specifications and developed further recommendations for the design of the enterprise Pavlik Gold Mining Company. LLC "SPC Soil Bases and Foundations"
LLC NPC Soil Base & Foundations has been working with the laboratory of MSU Geophysics LLC since 2008. During this time, laboratory studies were carried out as part of engineering-geological surveys for various objects carried out on the orders of large design and survey organizations. In the course of carrying out engineering and geological studies, the staff of the laboratory of OOO MSU-Geofizika conducted laboratory studies of soil and office work on the preparation of reporting materials. The team showed high qualification, the ability to work with any type of soil, taking into account the regional characteristics of the territories, as well as perform research on objects at all levels responsibility. Including the laboratory of MSU-Geofizika LLC performed a complex for determining the strength characteristics of soils in triaxial compression devices both on heated and on cooled and frozen soils. All works were completed in a quality and timely manner. The results of engineering and geological studies were transmitted both to the designers themselves, and as part of the consolidated report, they were examined by experts of the examination. Everywhere reviews were received with a high rating. In addition to high professional competence, laboratory staff is characterized by organization, mobility responsiveness to customer requirements. 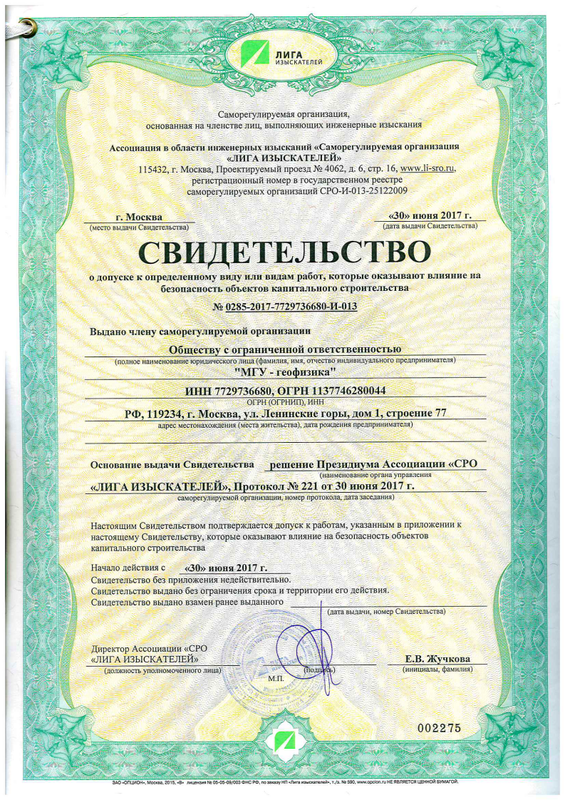 In many cases, when performing work in addition to the requirements of the regulatory documents, they used their own methodological developments of the laboratory staff, and developments of the geological faculty of Moscow State University. 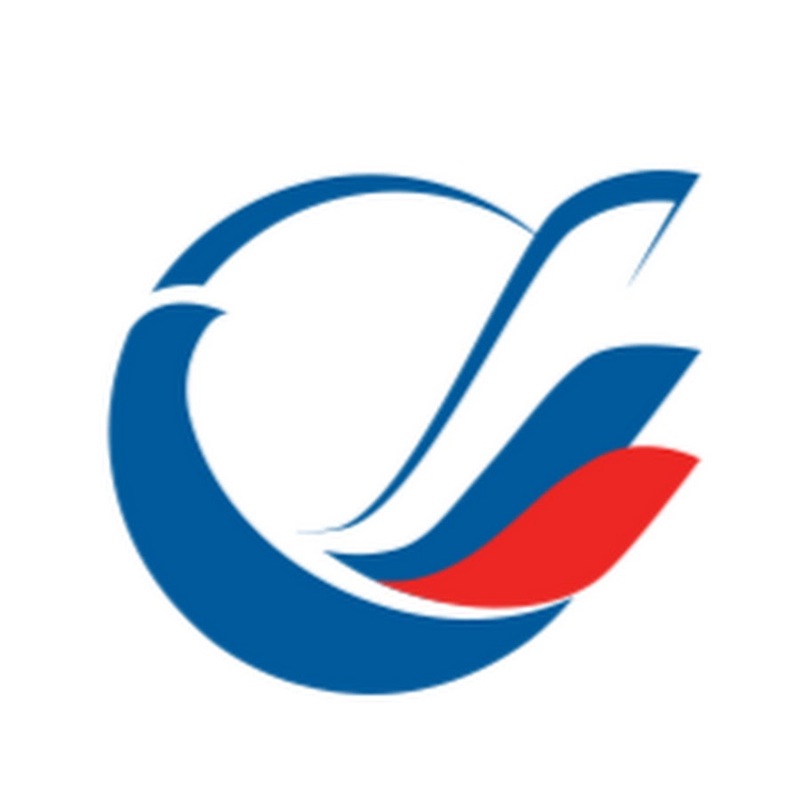 Mv Lomonosov, undoubtedly improving the quality of work. For all the time of cooperation, the laboratory has established itself as a reliable and stable partner. Currently, NPT Soil Foundation and Foundations LLC has business contacts with MSU Geophysics LLC and hopes to continue them in the future. MSU Geophysics LLC in 2011-12 carried out an update of the complex engineering surveys on the object: “Gas pipeline of external transport from the gas processing plant of the East Urengoi license area to the Urengoy-Center I, II gas pipelines, as well as laboratory studies of the physical and mechanical properties of soils on the object“ Internal site roads, water supply routes, sewage, warehouse VM, NVK and overhead power lines in the area of ​​the main works of the Cancun hydroelectric station on the river. Timpton. " As part of these projects, a full range of engineering and geological surveys in areas of the far north were carried out. Including drilling, a complex of thermometric studies and testing of frozen and thawing soils in the laboratory. In the framework of laboratory studies, a full range of determination of the strength and deformation characteristics of frozen and thawing soils was performed. In the course of the study, the laboratory team showed high qualifications of its specialists, the use of methods not only of normative documents, but also innovative methods developed by the geological department. The employees of MSU Geophysics LLC are characterized by high professionalism, well-coordinated work and responsiveness to customer requirements. For all the time of cooperation, the laboratory has established itself as a reliable and stable partner, able to accurately fulfill its obligations. 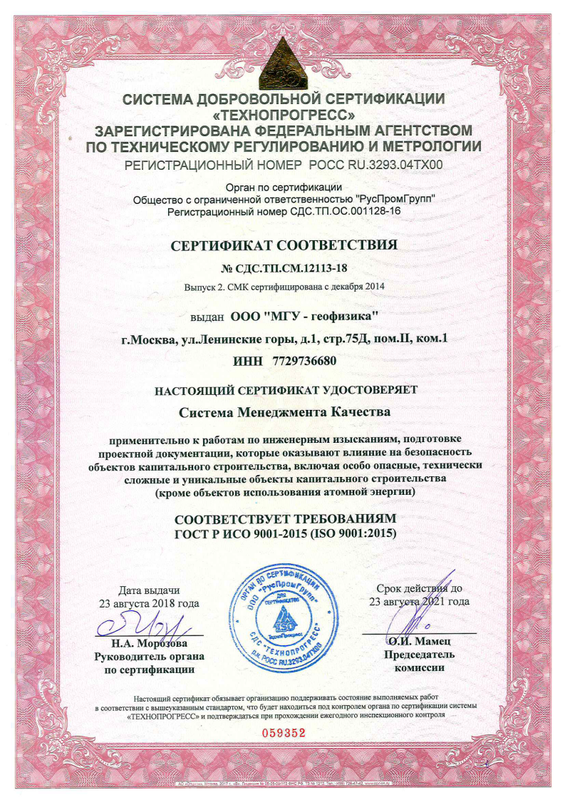 All employees of MSU-Geophysics LLC are graduates of the Geological Faculty of Lomonosov Moscow State University. Currently we are continuing projects with MSU-Geophysics LLC and we hope to continue in the future. 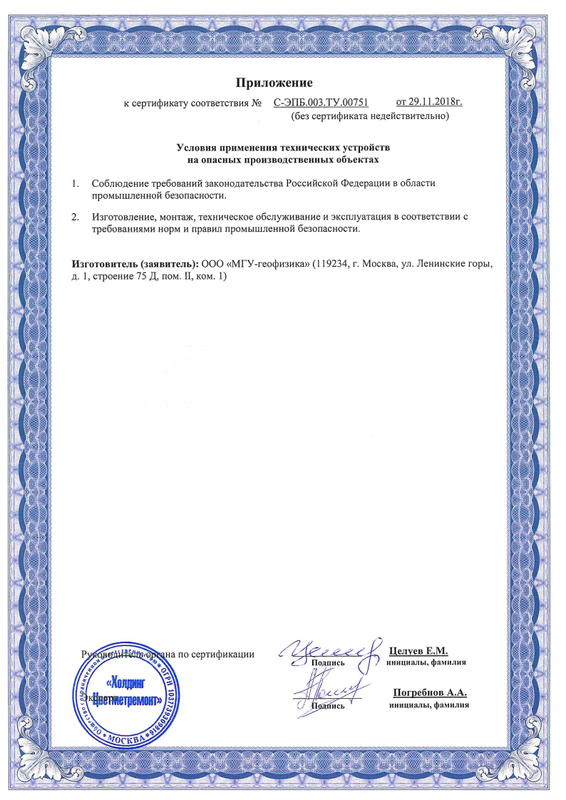 MSU Geophysics LLC performed work under Contract No. 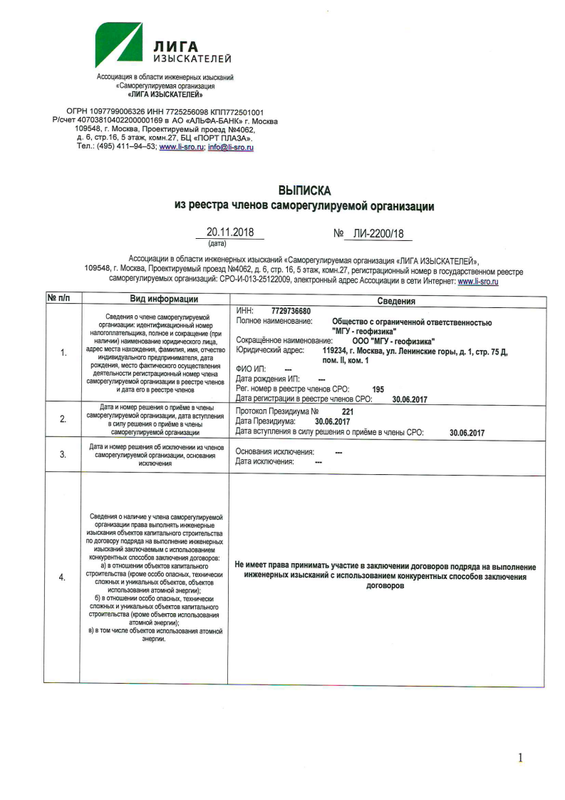 1810/1 dated 10/10/2018 on engineering and geophysical research at the Olginskoye field located in the Tenkinsky district of the Magadan Region. The works were performed in accordance with the technical specifications, in the proper quality and within the prescribed period. At the same time, in the course of production, the wishes of the Customer were taken into account as much as possible. The results allow us to continue research, including the verification of geophysical data by drilling operations. During the time of the work, LLC MSU-Geophysics proved itself as a highly professional company with the availability of qualified personnel, quickly and efficiently solving the tasks set by the Customer. Employees of the company are always ready to meet the high requirements of the customer. All wishes and comments arising during the joint work with the Customer were eliminated as soon as possible and at a high professional level.